San Ysidro Health’s Center for Research and Health Promotion offers a variety of free programs to educate patients on how to manage their conditions, improve their health, and stay healthy. 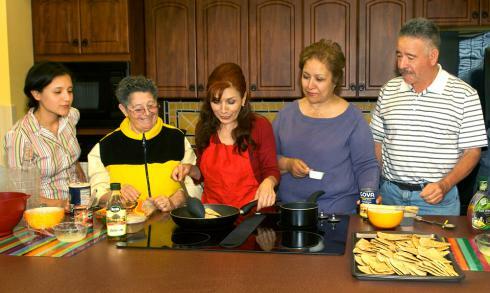 San Ysidro Health’s cooking classes teach patients how to make healthy and delicious meals. We also offer special classes for pregnant women and parents of pre-school children. Cooking classes are taught in San Ysidro Health’s Cocina – a teaching kitchen / classroom located inside The Maternal and Child Health Center. All registered patients may attend any of San Ysidro Health’s cooking classes. Provides assistance with navigating the HIV care system, including linkages to HIV medical care, medications, housing, food, transportation and other social services. Provides counseling for HIV-positive individual clients, couples, families and groups, including relapse prevention and early recovery therapy. Focuses on reducing the spread of HIV through individual and group services, as well as access to HIV testing with same-day results. A variety of culturally relevant and linguistically appropriate support groups are offered to encourage peer support and interaction. CASA and Our Place also offer linkage to HIV Specialty Medical Care and Treatment, as well as application assistance to Ryan White and The AIDS Drug Assistance Program (ADAP). The FRC helps families with application assistance for food stamps, housing, gas and electric bill support, domestic violence referrals, legal assistance, and other support services. It is located on the 2nd floor of The Maternal and Child Health Center. The Healthy Steps Mobile Medical Units provide health care services to children and adults of all ages throughout the Central and South Bay communities. People in need of additional care are referred to one of San Ysidro Health’s clinic sites. Mobile Health Services’ parenting and anger management classes are also offered to parents, families and community partners. San Ysidro Health social workers can help you to connect with a wide array of family support services and referrals outside of medical care. The San Ysidro Health Teen Clinic offers free and low cost, confidential reproductive health services for teens on topics such as: anatomy and physiology; birth control; pregnancy; sexually transmissible infections (STI) testing and counseling; and healthy relationships. The Teen Clinic is a parent-free environment and is open Monday – Friday from 1:30-5:00 p.m. For more information or to make an appointment, call or text 619.800.TEEN (8336). San Ysidro Health Teen Health Educators work with both The Sweetwater Union High School District and San Diego Unified School District, plus other local agencies to provide group-based education on health issues relevant to teens. San Ysidro Health Health Education classes cover topics such as nutrition & physical activity, body image & self esteem, healthy relationships, reproductive anatomy & physiology, contraceptive methods, STI’s, alcohol use, tobacco use, and the effects / consequences / dangers of other drug use. San Ysidro Health offers onsite health clinics at Palomar High School (Chula Vista), Southwest High School (South San Diego), and Lincoln High School (Southeastern San Diego). Students who need medical care for minor illnesses or injuries, immunizations, and / or physical exams can easily go to these clinics without leaving the school campus. San Ysidro Health also offers onsite clinical services, Wednesdays at San Ysidro High School (South San Diego) and Tuesdays and Thursdays at Chula Vista High School through its Medical Mobile Unit. San Ysidro Health offers no-cost transportation to clinic appointments for registered San Ysidro Health patients. Transportation must be scheduled 2 weeks in advance. Please notify us if you shall need wheelchair assistance. Transportation Service Hours are Monday through Friday from 8:00 AM to 4:00 PM. Please call 619.662.4137 to schedule a transportation appointment.